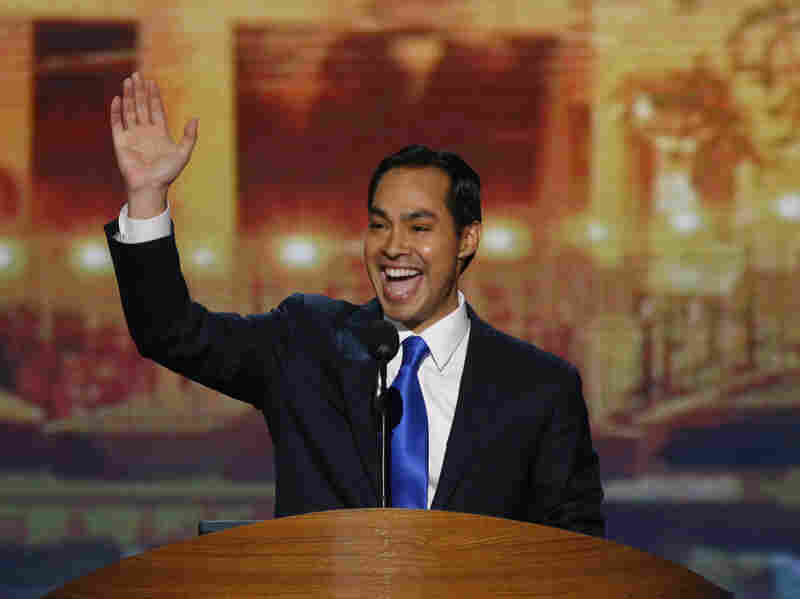 Transcript: Julian Castro's DNC Keynote Address Transcript of San Antonio Mayor Julian Castro's keynote speech Tuesday at the Democratic National Convention. San Antonio Mayor Julian Castro delivers the keynote address at the Democratic National Convention in Charlotte, N.C., on Tuesday. As my grandmother got older, she begged my mother to give her grandchildren. She prayed to God for just one grandbaby before she died. You can imagine her excitement when she found out her prayers would be answered—twice over. She was so excited that the day before Joaquin and I were born she entered a menudo cook-off, and she won $300! That's how she paid our hospital bill. By the time my brother and I came along, this incredible woman had taught herself to read and write in both Spanish and English. I can still see her in the room that Joaquin and I shared with her, reading her Agatha Christie novels late into the night. And I can still remember her, every morning as Joaquin and I walked out the door to school, making the sign of the cross behind us, saying, "Que dios los bendiga." "May God bless you." My grandmother didn't live to see us begin our lives in public service. But she probably would have thought it extraordinary that just two generations after she arrived in San Antonio, one grandson would be the mayor and the other would be on his way—the good people of San Antonio willing—to the United States Congress. My family's story isn't special. What's special is the America that makes our story possible. Ours is a nation like no other, a place where great journeys can be made in a single generation. No matter who you are or where you come from, the path is always forward. America didn't become the land of opportunity by accident. My grandmother's generation and generations before always saw beyond the horizons of their own lives and their own circumstances. They believed that opportunity created today would lead to prosperity tomorrow. That's the country they envisioned, and that's the country they helped build. The roads and bridges they built, the schools and universities they created, the rights they fought for and won—these opened the doors to a decent job, a secure retirement, the chance for your children to do better than you did. And that's the middle class—the engine of our economic growth. With hard work, everybody ought to be able to get there. And with hard work, everybody ought to be able to stay there—and go beyond. The dream of raising a family in a place where hard work is rewarded is not unique to Americans. It's a human dream, one that calls across oceans and borders. The dream is universal, but America makes it possible. And our investment in opportunity makes it a reality. Now, in Texas, we believe in the rugged individual. Texas may be the one place where people actually still have bootstraps, and we expect folks to pull themselves up by them. But we also recognize there are some things we can't do alone. We have to come together and invest in opportunity today for prosperity tomorrow. And it starts with education. Twenty years ago, Joaquin and I left home for college and then for law school. In those classrooms, we met some of the brightest folks in the world. But at the end of our days there, I couldn't help but to think back to my classmates at Thomas Jefferson High School in San Antonio. They had the same talent, the same brains, the same dreams as the folks we sat with at Stanford and Harvard. I realized the difference wasn't one of intelligence or drive. The difference was opportunity. In my city of San Antonio, we get that. So we're working to ensure that more four-year-olds have access to pre-K. We opened Cafe College, where students get help with everything from test prep to financial aid paperwork. We know that you can't be pro-business unless you're pro-education. We know that pre-K and student loans aren't charity. They're a smart investment in a workforce that can fill and create the jobs of tomorrow. We're investing in our young minds today to be competitive in the global economy tomorrow. And it's paying off. Last year the Milken Institute ranked San Antonio as the nation's top performing local economy. And we're only getting started. Opportunity today, prosperity tomorrow. Now, like many of you, I watched last week's Republican convention. They told a few stories of individual success. We all celebrate individual success. But the question is, how do we multiply that success? The answer is President Barack Obama. Mitt Romney, quite simply, doesn't get it. A few months ago he visited a university in Ohio and gave the students there a little entrepreneurial advice. "Start a business," he said. But how? "Borrow money if you have to from your parents," he told them. Gee, why didn't I think of that? Some people are lucky enough to borrow money from their parents, but that shouldn't determine whether you can pursue your dreams. I don't think Governor Romney meant any harm. I think he's a good guy. He just has no idea how good he's had it. We know that in our free market economy some will prosper more than others. What we don't accept is the idea that some folks won't even get a chance. And the thing is, Mitt Romney and the Republican Party are perfectly comfortable with that America. In fact, that's exactly what they're promising us. The Romney-Ryan budget doesn't just cut public education, cut Medicare, cut transportation and cut job training. It doesn't just pummel the middle class—it dismantles it. It dismantles what generations before have built to ensure that everybody can enter and stay in the middle class. When it comes to getting the middle class back to work, Mitt Romney says, "No." When it comes to respecting women's rights, Mitt Romney says, "No." When it comes to letting people marry whomever they love, Mitt Romney says, "No." When it comes to expanding access to good health care, Mitt Romney says, "No." Actually, Mitt Romney said, "Yes," and now he says, "No." Governor Romney has undergone an extreme makeover, and it ain't pretty. So here's what we're going to say to Mitt Romney. We're going to say, "No." Of all the fictions we heard last week in Tampa, the one I find most troubling is this: If we all just go our own way, our nation will be stronger for it. Because if we sever the threads that connect us, the only people who will go far are those who are already ahead. We all understand that freedom isn't free. What Romney and Ryan don't understand is that neither is opportunity. We have to invest in it. Republicans tell us that if the most prosperous among us do even better, that somehow the rest of us will too. Folks, we've heard that before. First they called it "trickle-down." Then "supply-side." Now it's "Romney-Ryan." Or is it "Ryan-Romney"? Either way, their theory has been tested. It failed. Our economy failed. The middle class paid the price. Your family paid the price. Mitt Romney just doesn't get it. But Barack Obama gets it. He understands that when we invest in people we're investing in our shared prosperity. And when we neglect that responsibility, we risk our promise as a nation. Just a few years ago, families that had never asked for anything found themselves at risk of losing everything. And the dream my grandmother held, that work would be rewarded, that the middle class would be there, if not for her, then for her children—that dream was being crushed. But then President Obama took office—and he took action. When Detroit was in trouble, President Obama saved the auto industry and saved a million jobs. Seven presidents before him—Democrats and Republicans—tried to expand health care to all Americans. President Obama got it done. He made a historic investment to lift our nation's public schools and expanded Pell grants so that more young people can afford college. And because he knows that we don't have an ounce of talent to waste, the president took action to lift the shadow of deportation from a generation of young, law-abiding immigrants called dreamers. I believe in you. Barack Obama believes in you. Now it's time for Congress to enshrine in law their right to pursue their dreams in the only place they've ever called home: America. Four years ago, America stood on the brink of a depression. Despite incredible odds and united Republican opposition, our president took action, and now we've seen 4.5 million new jobs. He knows better than anyone that there's more hard work to do, but we're making progress. And now we need to make a choice. It's a choice between a country where the middle class pays more so that millionaires can pay less—or a country where everybody pays their fair share, so we can reduce the deficit and create the jobs of the future. It's a choice between a nation that slashes funding for our schools and guts Pell grants—or a nation that invests more in education. It's a choice between a politician who rewards companies that ship American jobs overseas—or a leader who brings jobs back home. This is the choice before us. And to me, to my generation and for all the generations to come, our choice is clear. Our choice is a man who's always chosen us. A man who already is our president: Barack Obama. In the end, the American dream is not a sprint, or even a marathon, but a relay. Our families don't always cross the finish line in the span of one generation. But each generation passes on to the next the fruits of their labor. My grandmother never owned a house. She cleaned other people's houses so she could afford to rent her own. But she saw her daughter become the first in her family to graduate from college. And my mother fought hard for civil rights so that instead of a mop, I could hold this microphone. And while she may be proud of me tonight, I've got to tell you, Mom, I'm even more proud of you. Thank you, Mom. Today, my beautiful wife Erica and I are the proud parents of a three-year-old little girl, Carina Victoria, named after my grandmother. A couple of Mondays ago was her first day of pre-K. As we dropped her off, we walked out of the classroom, and I found myself whispering to her, as was once whispered to me, "Que dios te bendiga." "May God bless you." She's still young, and her dreams are far off yet, but I hope she'll reach them. As a dad, I'm going to do my part, and I know she'll do hers. But our responsibility as a nation is to come together and do our part, as one community, one United States of America, to ensure opportunity for all of our children.